The forum I mentioned in my last column took place last Sunday, Aug. 2, at the San Fernando Valley JA Community Center with 93 in attendance. A Hiroshima/Nagasaki art exhibit presented by Nisei Week honoree Richard Fukuhara served as a backdrop for this most memorable 70th anniversary of the dropping of the bombs. I welcomed the gathering, noting that what had prompted me to initiate the forum was my need to, after 70 years, come to terms with the event, examining it once more with its many facets. When the bombs were dropped, I was relocated from the Amache internment camp in Colorado with my family to Milwaukee, Wisconsin. My loyalty to this country was suspect, and I readily accepted the government’s version of their reasons for the bombings. I attended a forum in March that was produced by Robert Horsting and Richard Fukuhara, which had the same title, and was inspired to pursue the subject at the event that was held last week. Following this were three video interviews — Grant Hirabayashi (MIS), who interrogated Japanese prisoners of war; Hideo Sakata, a Nagasaki hibakusha; and Ms. Kaz Suyeishi, a Hiroshima hibakusha. Following this was an interview with Dr. James Yamasaki, physician in charge of investigating the after-effects of the bombing on pregnant women in Nagasaki. Then Wataru Namba, a Hiroshima hibakusha, spoke, revealing his shocking experience as a young child surviving in the aftermath of the bombing. Kikuko Otake served on a panel and told of her experience as a child in Hiroshima, barely escaping the blast, while losing her father. 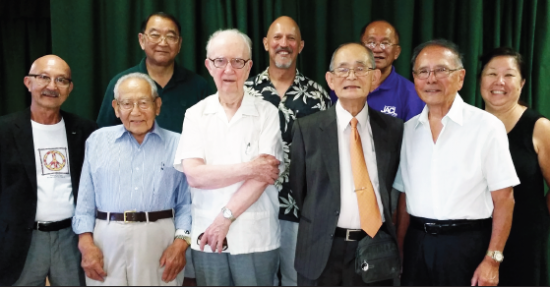 Participants in the Hiroshima/Nagasaki presentation on Aug. 2 at the San Fernando Valley JACC (from left) Richard Fukuhara, Wataru Namba, Paul Jonokuchi (community center president), John Cobb, Robert Horsting, Dickson Yagi, Harold Kameya, Phil Shigekuni, and Nancy Takayama. Our keynote speaker was Dr. John Cobb, who was born in Japan of Methodist missionary parents. He said his earliest memories were of his childhood in Hiroshima before moving to the U.S. in 1940. He returned to Japan after the war as a member of the U.S. occupation force, and subsequently served as professor of theology at the Claremont School of Theology until his retirement in 1990. In his introduction, Robert Horsting said Dr. Cobb has six honorary doctor of philosophy degrees, and has written over 50 books. His presentation was entitled “The Problem of Morality in Total War.” With his background, what he had to say in his address surely had to be taken seriously. He started by saying after the bombs were dropped in Hiroshima and Nagasaki, he became emotionally affected, and had a fever that lasted for a few days. Dr. Cobb said that in total war, all in this country are guilty. Although we are not able to affect choices made by the government for good or ill, when we pay our taxes, we are complicit. In a total war, civilians become involved, and the first example in this country came during the Civil War in the South when civilians were exposed to the fighting. This degenerated over the years into what happened in Japan when the firebombing of Japanese cities was intentionally meant to kill civilians. Dr. Cobb says the climate of total war makes for extreme positions taken, making no provision for compromise. The U.S. demanded unconditional surrender. Japan, after suffering losses on all fronts and devastation by firebombing of 60+ cities, desperately sought to surrender. They were denied because according our terms of surrender, the emperor had to suffer consequences. Dr. Cobb said allowing the emperor to not be prosecuted would have resulted in an honorable surrender and made unnecessary the dropping of the bombs. As history recorded, Japan’s surrender finally came with its emperor maintaining his position. Dr. Cobb called comparing the attack at Pearl Harbor as justification for the A-bombings nonsense. He said that President Theodore Roosevelt called Japanese “honorary Aryans,” which encouraged their military actions. Because of the oil embargos imposed on the Japanese, President Franklin Roosevelt was expecting a Japanese attack to occur somewhere in the Pacific. Their attack at Pearl Harbor was, like any other military attack, made without warning. Dr. Cobb said that to compare this attack with the bombing (atomic or incendiary) of innocent civilians is wrong. Dr. Cobb then cited our oppressive colonialism in the Philippines and our treatment of Native Americans as evidence of our moral failing. He concluded his powerful address by asking what we can do to counter our war-like nature. He proposed that if we took the energy we spend in making war and used even one percent of that to study peace, this would be a good start. Studying Hiroshima/Nagasaki can cause us to look at ourselves and begin to care more about peace. After a reading by 16-year-old Tristan O’Donnell and Harold Kameya relating the pros and cons for using the A-bomb, the forum continued with a Q&A panel consisting of Mr. Namba, Ms. Otake and Dr. Cobb moderated by Robert Horsting. In conclusion,“Let There be Peace on Earth” was sung by the gathering accompanied by Nancy Gohata and myself. 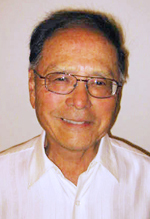 Phil Shigekuni writes from San Fernando Valley and can be contacted at [email protected] Opinions expressed are not necessarily those of The Rafu Shimpo.